The result saw the visiting side increase its tally to eight points while Chennayin moved to five points from nine matches. Also, CFC moved to eighth spot on the points table ahead of FC Pune City on the basis of goal difference. It was a match of missed opportunities as both the teams couldn't make the most of the opportunities they had. Like in the first half, Chennaiyin applied pressure on the Kerala backline but without any luck. They had some good chances but nobody could convert it, despite having a virtual empty goal. 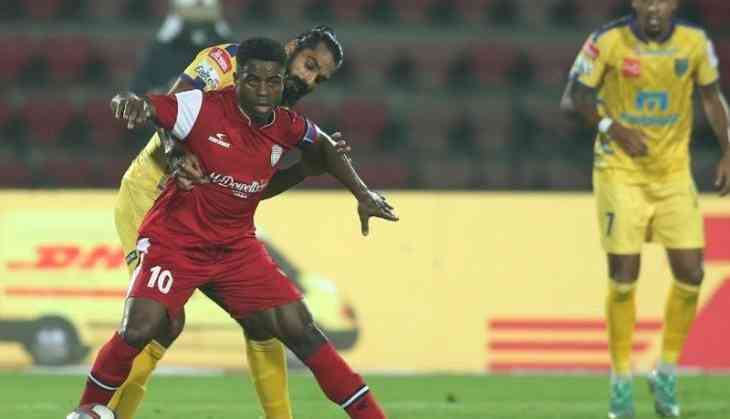 Kerala managed to hang on and with the introduction of Sandesh Jhingan and Seiminlen Doungel, they had a few superb chances of their own to score, but couldn't find the back of the net. Sahal Abdul Samad latched on to a pass from Keziron Kizito in the 55th minute and slammed a left-footer but debutant goalie Sanjiban Ghosh came up with a superb save to deny the Blasters a goal in what was the first real chance for the visitors. The first half saw the two teams take time to find rhythm. Chennaiyin had a lot of good chances as they exploited the high line from the visiting side's backline but a goal eluded the defending champion. Isaac Vanmalsawma and Thoi Singh missed sitters. The home side kept pressing forward but they could not get the ball into the rival net. Chennaiyin FC had an opportunity right at the beginning and Raphael Augusto found Isaac Vanmalsawmas, only to see him miss a sitter. In the 33rd minute, Thoi Singh got a pass from Jeje but shot wide with the goalkeeper at his mercy. Augusto was at the centre of several Chennaiyin moves which resulted in chances, that went abegging. In a significant move, Chennayin brought in Sanjiban Ghosh for Karanjit Singh, who has found the going tough in recent games and Jeje Lalpekhlua was included in the starting XI.